Medicare Rolls Out Carrots And Sticks For Hospital Quality : Shots - Health News Medicare is withholding 1 percent of its regular hospital payments to fund bonuses for hospitals that score well on quality tests. Separately, Medicare will penalize hospitals that have higher than expected readmission rates. 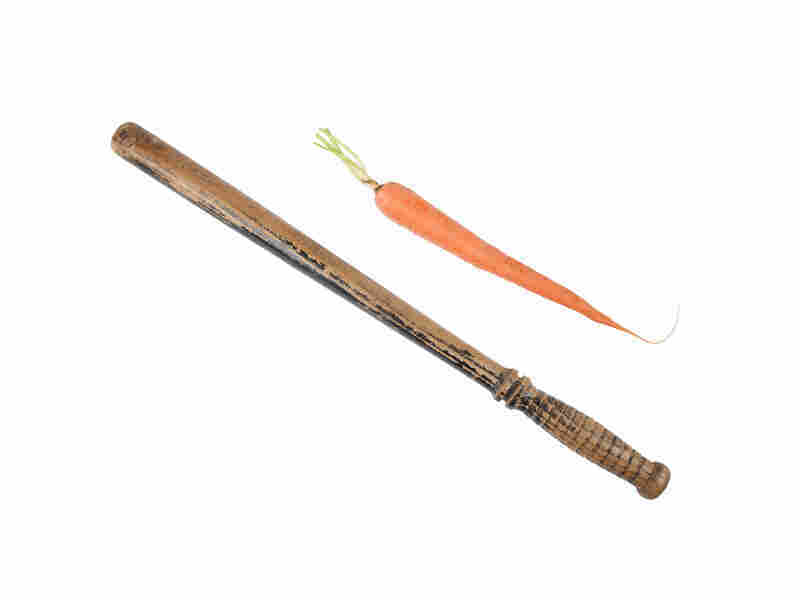 Medicare to hospitals: Take your pick of carrot or stick. Starting today, America's hospitals will find that their checks from Medicare are a little bit lighter. As part of the government's biggest effort yet at paying for performance, Medicare is withholding 1 percent of its regular hospital payments and putting that money into a fund to reward hospitals that score well on 20 different quality measures. Under the new Value-Based Purchasing Program, which was created by the 2010 health care law, money will be returned to some hospitals over the course of the fiscal year that began Oct. 1 based on how well the hospitals followed clinical guidelines for basic care and how they fared in patient satisfaction surveys. In a dry run using older data, 1,405 hospitals would get back some money but still come up short; 550 hospitals would break even and 1,448 hospitals would end up getting bonuses. Medicare estimates about $850 million will be reallocated among hospitals under the program. Medicare has yet to release specific figures for how much each hospital will be getting back, but you can view each hospitals' scores on Medicare's Hospital Compare website. Seventy percent of a hospital's score will be based on 12 measures that show how frequently hospitals performed recommended protocols, such as giving antibiotics to surgery patients within an hour of surgery. The other 30 percent of a hospital's value-based purchasing payment will be based on how it scored on random surveys of patients taken after they were discharged. These questions include ones asking how well their doctors and nurses communicated, whether rooms were clean and quiet and whether pain was dealt with promptly. Also today, Medicare is applying a separate penalty to 2,211 hospitals with higher than expected readmission rates. Hospitals with the highest rates for heart attack, heart failure and pneumonia patients will lose 1 percent of their regular reimbursements. The Readmissions Reduction Program also was established by the health care law. Medicare expects hospitals together will forfeit about $280 million this year. The maximum penalty grows to 2 percent next year and 3 percent in October 2015. Kaiser Health News has published the 2013 readmission penalties for all hospitals in a downloadable PDF file. The value-based purchasing and readmissions programs represent a new step for Medicare, which has until now limited its pay-for-performance efforts to hospitals that voluntarily participate in pilot experiments such as getting doctors and hospitals to join together into accountable care organizations and giving caregivers a lump sum bundled payment to cover all the costs of a patient's care both in the hospital and afterward. The new programs are mandatory for most acute care hospitals, with roughly 3,000 hospitals automatically enrolled.